An interactive lunch experience infused with cuteness. My Cup of Tea is Anime USA’s proprietary Maid Café that began operation in 2009. 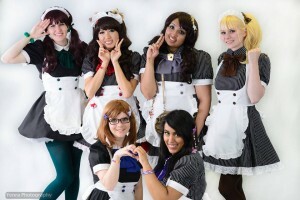 We pride ourselves in providing attendees with an experience like that of a authentic Japanese maid café. Maid cafés employ waitresses in uniforms who serve customers with an upbeat attitude, while providing a laid-back and fun atmosphere for all to enjoy. Common in our café is the concept of “moe”, which is essentially lots of cuteness! 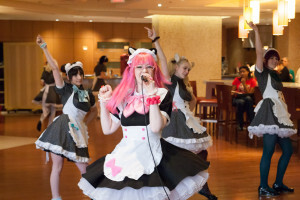 My Cup of Tea allows Anime USA attendees with opportunity to experience an interactive and affordable lunch experience during the Anime USA convention. We offer games available to play with a maid of your choosing, a photo opportunities with your friends and maids, adorable dance performances, and chances to participate in karaoke competitions, all while being able to enjoy a delicious meal. Visit us for a one-of-a-kind experience at the next Anime USA event. Master and Princess, you can follow our adventures on our Official Blog and Facebook Page!